New Year’s superstitions are abundant. From eating 12 grapes to smooching at midnight, the way you spend New Year’s Eve sets the tone for the year ahead—be sure your makeup is equally lucky. 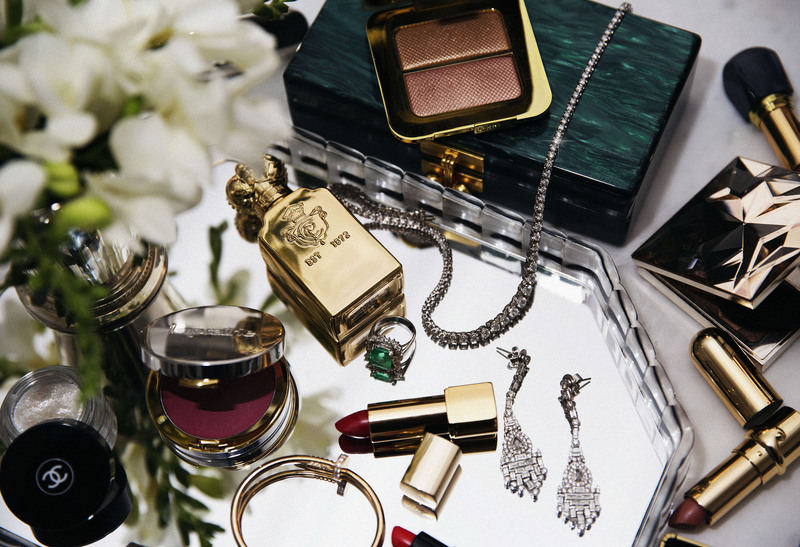 I’ve created one of my favorite makeup looks to ring in the new year, paired perfectly with my favorite perfume, an emerald green clutch and a pair of dazzling dancing shoes. Toss the confetti and pop the champagne—with the perfect party makeup, this is sure to be your best year yet! This New Years Eve, go brighter by adding a layer of an orange lipstick shade over your favorite red. Matte, velvet or lacquered, your end-of-the-year bash calls for heightened drama and a cherry lip is a classic look. Keep the rest of your makeup simple: shimmery eyes with a hint of glitter in the center to make your eyelids stand out. Draw a classic eyeliner and add several coats of mascara- lashes optional. Finish it off with a bold and ultra-chiseled cheek for a 70s disco vibe. This is one of those evenings that calls for an ultra highlighted cheek to provide that extra drama when the clock strikes midnight.